The Sri Kalahasti temple is as important to Shaivites as the Tirupati temple is to Vaishnavites. It is home to one of the Pancha Bhoota Lingams (lingams related to the five elements), it is a shrine associated with a great saint – Kannappa Nayanar; and is also a parihara sthalam – where special pujas are conducted to appease the twin deities Rahu and Ketu. There are several stories associated with the Sri Kalahasti temple, most prominent among which is the one which gives the temple its name. As the legend goes, this Shiva Lingam was discovered in the forest by three animals – a spider, an elephant and a snake. Each of them prayed to the Lord in their own manner. The spider wove a web over the lingam to protect it from the elements, the snake placed precious stones on it to decorate it, and the elephant carried fresh water from the nearby river to clean it up. The three animals were unaware of each other, and each considered himself to be the sole guardian of the lingam. However, every time the elephant poured water on the lingam, the spider web and the precious stones were washed away. This angered the spider and snake, who lay in wait to see who had despoiled their efforts, and found out about the elephant. A fight ensued among the three in which the snake managed to bite the elephant, and as he fell, the elephant speared the snake with his tusks and crushed the spider. All the three died, but were blessed by Lord Shiva for their unwavering faith and devotion. All the three were born again as kings, built huge temples to the Lord, and finally attained salvation. Meanwhile, this icon of the Lord is known by his three earliest devotees as Sri Kalahasteeswara – the Lord(Easwara) of the spider(Sri), the snake (Kala) and elephant (hasti)! It is the association with a snake which gives the temple its importance as a parihara sthalam, where pujas are performed to appease Rahu and Ketu, who are considered the two halves of a snake. The second story of the temple relates to Kannappa Nayanar – the saint associated with this temple. Instead of writing the entire story down here, let me direct you to my stories blog where I have already written it. Click on the following link to read the story. There is also a temple dedicated to the saint on a hillock near the temple. I have never visited the temple yet, but from what I have heard, it is an easy trek up the hill. It is something which I plan to try out on another trip. Meanwhile, if any of you have been there, I would love to hear about it. The third story concerns the first temple which was built for the Shiva Lingam in the forest, and the river which flows alongside. As the story goes, a merchant in the nearby town had a dream in which the Lord appeared before him, and asked him to go and look for the lingam in the forest and build a temple there. The merchant was so excited by this that he woke up at once to share the news with his wife. He hastened to the forest and soon found the lingam. With his huge wealth at his disposal, he started hiring people to build the temple. As time passed, the work progressed slowly, but his money soon ran out and he was forced to sell everything he owned to pay the workers. At last, he had nothing left, and he wept in front of the Lord, ashamed that he could not complete the work he had been entrusted with. The Lord appeared before him in a dream again and said, “I did ask you to build a temple, but I did not ask you to use your own money. You were so proud of your wealth and sure of your ability to build the temple that you did not wait till I told you how to do it!” The merchant realized his folly and humbly requested the Lord to tell him how to continue the work. The Lord replied, “Ask the workers to bathe in the river before starting work, and after completing their work for the day, ask them to bathe again in the river, and then scoop out sand from the river bed. They will find in their hands, the payment for their services.” The merchant was surprised to hear this, but he assured the Lord that he would do as he was told. He wondered how he would assure the workers of such a thing, and if they would believe him. He shared his doubts with his wife, who said that they should first try it out themselves. Accordingly, the merchant and his wife bathed in the river the next morning, and worked on the temple by themselves doing what they could. At the end of the day, the tired couple headed for the river, where they bathed again, and found themselves as fresh and energetic as ever. They then scooped out the sand from the river bed as the Lord had advised, and were surprised when they found that instead of sand, they held gold coins in their hands! Now that they had tried it out for themselves, all their doubts were cleared and they managed to convince the workers to come back to work. Each day, every worker bathed in the river before and after work, and when they scooped out the river bed sand, found exactly as many gold coins as they deserved for that day’s work – no more, no less! Work now progressed much faster, and at last, the temple was built! This is when the river earned the name ‘Swarnamukhi’ – the river which gave out gold coins! The goddess here is Parvati as Gnana Prasunanmba. According to another legend, Parvati was once cursed by Shiva to leave off her heavenly body and become a human. She meditated here, and was finally blessed by Lord Shiva, who not only restored her to her original status but also endowed her with the highest of divine knowledge. The temple is a delight to roam around, with beautiful carvings and images all over. 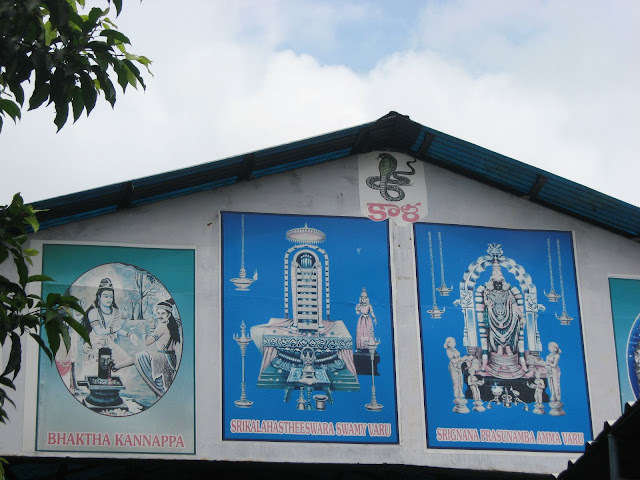 A must see is a shrine to Patala Ganapathy under the ground. This shrine is associated with the earliest temple built here, and it is said that the idol of Lord Ganesha here marks the bed of the river flowing by the temple. There is usually a long queue here, since people are allowed into the shrine in batches. I have been to this temple twice, but never been inside this shrine, since I have never had the patience to stand in yet another queue! http://www.srikalahasti.org/ This is the temple website which has some interesting details about the temple. I have visited this temple, a grand and huge compound it had... And yes we had to stand for about 2 hours in the line to get the darshan!! This is really nice story. very less people are aware of these stories. The Rajagopuram of this temple fell recently. have they started constructing a new one? I also visited this temple twice and had darshans too. Want to got there once more. I haven't seen the pathala Ganapathy there as we headed straight to have the Lord's darshan. @Arti: yes, it has a huge compound! and we were lucky to find the temple practically empty! the last time i visited, there was quite a queue! @Chitra: no, doesnt look like they have... we entered a different way, and didnt see it, but our auto driver told us that there were problems with the heritage committee and who should construct it... as usual!! have heard about these legends a little before..but never knew in detail..thx a lot..